Social and Emotional Development of Gifted Children: What Do We Know ReviewThe Social and Emotional Development of Gifted Children assembles terrific team of well-respected professionals in gifted, and compiles a great set of essays on the social and emotional aspects of growing up gifted in today's world, complete with the research references to back up thier facts. Authors including Neihart, Rogers, Gross, Silverman, Reis, Robinson, and more... the contributors read like a who's who of gifted education today. Everyone who works with, plays with, and parents gifted children should read this book. Topics include acceleration, the exceptionally gifted, Dabrowski's overexcitabilties, perfectionism, underacheivment, depression (does it really occur more, or less, in the gifted population?). Special populations are not overlooked, including female, male, gay, lesbian and bi-sexual, african-american, gifted / learning disabled and gifted / ADHD students. The book concludes with topics of parenting, counseling, and career counseling for gifted students. With all the research-based information, the Social and Emotional Development of Gifted Children is still readable and enjoyable. And it's FULL of research-proven techniques and strategies for dealing with the social and emotional aspects of growing up as a gifted child. 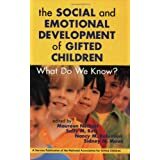 Want to learn more information about Social and Emotional Development of Gifted Children: What Do We Know?